BPT-When it comes to fruit, kiwis are often overlooked. That’s a shame because these tiny orbs pack big nutritional, culinary and palate-pleasing surprises. 1. There’s no need to peel kiwifruit. Kiwifruit is the perfect portable snack because it is easy to eat. Just cut in half with a knife and scoop with a spoon. That’s it — just cut, scoop, and enjoy. But before you cut, make sure it’s ripe. Hold a kiwifruit in the palm of your hand and squeeze gently. A ripe kiwifruit will give to slight pressure. Once kiwifruit is ripe, you can pop it in the refrigerator for up to 2 weeks (assuming you can resist eating it on the spot). 2. 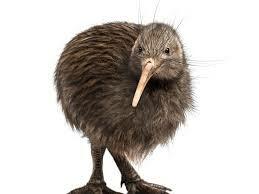 Not all kiwifruit is green and hairy. Kiwi like Zespri kiwi has a smooth, hairless skin and a juicy, yellow flesh — quite different than the fuzzy green kiwifruit to which most North Americans are accustomed. Their taste is tropical-sweet, like a cross between a mango and a strawberry. 3. Kiwifruit may help stabilize blood sugar (with other modifications like adding protein and exercise of course). The glycemic index, or GI, measures how a carbohydrate-containing food raises blood sugar. Fruits with a glycemic index (GI) less than 55 are considered low GI, meaning they produce a gradual rise in blood sugar levels that’s easy on the body. Kiwifruit’s low GI scores (green kiwifruit is 39 and SunGold is 38) and high fiber content allow for a slower rise in blood sugar levels than other fruits, providing energy and helping to fend off blood sugar spikes and crashes. 4. Kiwifruit may help ease digestive discomfort. Feeling a bit backed up? Kiwifruit may aid digestive concerns in several ways. For constipation, researchers believe the soluble and insoluble fibers in kiwifruit can promote laxation. 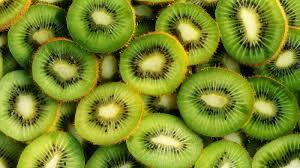 For bloating, both green and SunGold have actinidin, an enzyme unique to kiwifruit that helps break down protein and streamline digestion. 5. Kiwifruit is good for your gut. Kiwifruit provides prebiotic “food” to help the good bacteria that live in our digestive systems to plant themselves and thrive. When you consume kiwifruit, you’re also feeding the 100 trillion little helpers in your gut, which may help support immunity, mood regulation, and metabolism. Give yourself a perfect pairing of probiotics and prebiotics by enjoying plain full-fat greek yogurt topped with chopped kiwifruit. 6. Kiwifruit = delicious source of nutrients. Kiwifruit is tasty, but that’s not all. Just one serving has three times more vitamin C than an orange, as much potassium as a medium banana, and a serving of the green is high in fiber and a good source of folate. 7. Kiwifruit makes a mean meat tenderizer. The actinidin in kiwifruit that may help beat your bloat can also be a great meat tenderizer. Make your own marinade with two green kiwifruit, 2 tablespoons olive oil, 1 teaspoon apple cider vinegar and a dash of salt and pepper. Simply marinade for 10-15 minutes before tossing your beef, chicken or fish on the grill.